Mike Rynearson/The Arizona Republic Whap! Michael Kempe strikes with a blur as he works out with instructor Jeff Morgan. Ask Michael Kempe for the shirt off his back, and he'll gladly help you stay warm. Tell him you need a better view, and you can stand on his shoulders. Just don't ask him what time it is or how much money he has in his pocket. Kempe, 17, is evolving into a first-class martial arts student - but fate, in the form of a disease known as fetal alcohol syndrome, has played a cruel trick on him. Although he has overcome many of the side effects of FAS, he doesn't comprehend oral instruction. He has to be shown how to proceed, making learning in the classroom or on the martial arts mat extremely challenging. He writes poetry, gets B's in school and recently won a Junior Olympics bronze medal in tae kwon do. The Gila River Indian Community underwrote his trip to Orlando. He has a blue belt, two steps away from black, and someday he would like to try out for the U.S. Olympic team. Kempe is able to look at his accomplishments in a straightforward manner. "I love this," he said. "It's a great thing. I'm not really surprised I won a medal. If I came to the gym and not expended much effort, then I would have been surprised. "Considering everything I've been through and the amount of work I've been through, the amount of fatigue I've felt, I've earned everything." 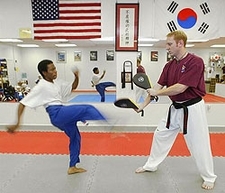 The director of the U.S. National Taekwondo Association, Bruce Harris, said it is not uncommon for youngsters who have a learning disability to turn to martial arts as a way to boost self-esteem. "If you can't communicate during a match, it makes it much tougher for him (Kempe)," Harris said. "What he's doing, I'm all for it." FAS affects as many as 12,000 infants a year. It is associated with alcohol consumption during pregnancy. The National Organization on Fetal Alcohol Syndrome says FAS is the leading known cause of mental retardation and birth defects. Those with FAS have a distinct pattern of facial abnormalities, growth deficiency and central nervous system dysfunction and may also have poor motor skills and hand-eye coordination. They also may have a complex pattern of behavioral and learning problems, including difficulties with memory, attention and judgment. Kempe, who will be a junior at Hamilton High School this fall, has been one of the lucky ones. Suzanne Lucier, Kempe's adoptive mother of 15 years, knew all about the risks involved when she took in Michael and his sister, Kay, now 15. She has an older adopted son, Lucas, 19, who is also afflicted with the syndrome. All three are involved in the martial arts, as is Emily, 14, her biological daughter. "FAS is a thief," said Lucier, who frequently lectures on the subject. "It steals lives and does permanent brain damage, a lot in the front lobes, where you have executive functions. So you have difficulty with action consequence. "While violence isn't a feature of FAS, and the biggest problem is that so many people don't understand it, the children are thought to be willful or stubborn instead of really understanding that they can't do certain things. "When you can't change the child, you must change the environment. They're not stupid. They just need to learn in a different way." A dangerous tentacle of FAS is that when a person is laden with unrealistic expectations, he believes he is not capable of doing something that others consider a simple task, she said. That's when secondary troubles can surface, such as alcohol and drug addiction and run-ins with the law. Kempe, however, has flourished in a positive environment, at home, school and at his Chandler tae kwon do school. He has become fascinated with the sport he chose eight years ago, and he practices six days a week. The school's name, Indomitable Spirit, seems to capture his persona perfectly. "It's a good thing he is doing this," said Dr. Mary Rimsza, a Valley pediatrician familiar with FAS. "They seem to have more difficulty with athletics because of less coordination." That hurdle has long been overcome by Kempe. His kicking and jumping continue to astound his instructor. Anytime he successfully completes a maneuver or does something unexpected, he seems to be the only one not surprised. "I know I'm going to work as hard as I can and push myself. That's how I got this far." His work ethic has never been questioned. Instructor Jeff Morgan laughs when he recalls the day that he told Kempe to kick a bag in the gym. "He's never said no to anything, even when we're working him to death," Morgan said. "One time when he was kicking the bag, he did it so much and so hard that his foot was bleeding. He told me to just put a Band-Aid on it, that he wanted to kick some more. He definitely won't quit. I could ask him to do anything, even some of the craziest ideas, and he would go out there and try it. "One day I asked him to do a double kick, and with two tries he had it figured out. He hangs in the air and does the kick-kick. He's capable of kicking me in the head, and I'm 6-foot-2." Morgan said that in the 11 months he has coached Kempe for competition, the progress has been significant. After only eight weeks, he won a gold medal in a state competition. And winning a medal in the Junior Olympics is quite an accomplishment for anyone, Morgan said. He said working with Kempe has made his rethink his coaching techniques. "It has forced me to learn a lot of patience and how to make a connection with him," he said. "I have to modify my teaching, my coaching style, based on the individual in front of me." Kempe does have to be shown a move a number of times before he can attempt it, and he said that can be frustrating at times. Once in a while, he said, he has to think, "I can get this. Just slow down and work it out." At some point, he said, he would like to be a veterinary technician, but the dream of the Olympics continues to be in his thoughts. It's one that is far-fetched for most aspirants, but it would be foolish to count him out, Morgan said. "I'd say the odds for anyone is maybe 1 in 2,000," he said. "It's a small but growing sport. Michael has the raw talent to do it. I think he has a 1 in 500 shot of making the team. He can definitely compete for it in three or four years. "There's no doubt that what he's accomplished in 11 months, it would take most people, myself included, a whole career to accomplish." What impresses Morgan is Kempe's humble attitude and his willingness to act as a role model for younger students, who watch in awe as he propels himself into the air and kicks. "All of those kids want to work as hard as Michael because they all want to kick me in the head, too," Morgan said. Instructor Chris Lopez said he first taught Kempe when he was a fourth-grader in a charter school. "Michael and his sister were always very respectful," Lopez said. "I'm most impressed with his dedication. He stuck with it over the year and worked some personal difficulties. "I remember as a kid Michael came up to me with philosophical thoughts, and I was impressed with that. He was trying to think beyond and below the surface, and that did impress me more than his physical ability. "He's built like a Bruce Lee, lean and defined, well-developed. He has the physical talent. As long he continues with his dedication, he has the building blocks necessary for him to compete at a high level." Lopez said that Kempe does a good job compensating for FAS-related problems and that he is most affected by the challenges of mainstream schooling. Staying focused and balanced is the hard part, he said. Kempe continues to buck the odds as FAS intrudes into his world. At school, for example, he works with caseworker Janet Kiefer two hours a day. She helps him finish his daily assignments and guides him through the maze of organization and time management. Lucier calls Kiefer "an angel in disguise." Kempe said he feels lucky in life because of the people surrounding him. He said his bronze medal in the national competition is the most exciting thing that has happened to him in the martial arts - "for now." Reach the reporter at jim.gintonio@arizonarepublic or (602) 444-8380.